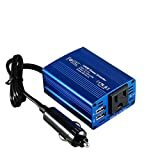 As someone who is constantly on the move , i’m sure you will agree with me that the best power inverter for car is an essential tool to have in your vehicle. Because of your busy schedule , there maybe times when you forget your phone’s charger at home only to realize that your phone’s battery is completely flat. In such situation , you can give your smartphone a little boost by charging it with your car via a USB chord but this can only be possible if you have the a good power inverter. Given the numerous options available on the market , it can be very confusing to pick a good power inverter for your vehicle. This section highlights the top 5 best power inverter for car 2018 that you can bank on anytime any day. Top of the list is the 300W power inverter made by BESTEK , a company that claims to be “America’s leading power inverter brand”. 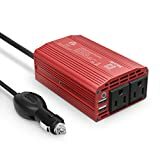 This best power inverter for car is a top seller and one of the most positively reviewed power Inverter on the market. As you can tell from its name , BESTEK 300W provides 300 Watts of continuous DC to AC power and 700 Watts of instantaneous power. This Inverter has 2 AC outlets which allows you charge 2 large electronics at a time (e.g laptops) if you wish , as well as 2 USB ports for charging smaller gadgets (e.g smartphones) , although we don’t recommend charging too many devices at the the same time. You don’t have to worry about the safety of your gadgets as this power inverter is integrated with safe charging design which provides protection against overheating, under and over voltage charging, short circuiting, overloads and overcharging. BESTEK is also offering an 18-Months Warranty which covers manufacturer’s defect. This Krieger model has a rating of 1500 watts and converts 12V DC to 120V AC supply. Depending on what your preference is, this power inverter is sufficient for most power applications ranging from gaming casuals to microwave ovens and medium sized HD TVs. Apart from the two 120volt outlets, the LCD screen display provides you with information about the inverter and the two USB ports for your mobile phone charging. There’s also a wired remote control connected to it as well as 3-foot (100% copper) power cables for extending its use to the outside of the vehicle. It features an ANL fuse for protection. This feature protects both the battery from the short circuit and your devices from surges and overloads. There’s more emphasis on protection apart from the ANL fuse kit, like the overload protection feature, the short circuit and temperature protections which in any event will be displayed on the LCD screen for your perusal. Other data displayed on the LCD display includes the input voltage, the output wattage and the battery level so that you can time your use and get the battery recharged when necessary. The Krieger kr1500 also has a 3-year warranty which covers both the parts and labor included in fixing any errors. This combined with over 200 positive reviews from merchant sites proves that this inverter is worth its salt. The Whistler XP800i is cost effective than most 800watt car power inverters. However, this not the only thing that differentiates it from its competition. This power inverter comes with two AC outlets and two USB ports for specific applications such as mobile phone charging. Given its 1600 watts’ peak power, this inverter is able to handle devices such as game consoles , laptops and other applications within the capability of that rating. It has a direct wire cable for extended use outside the vehicle, as well as all the protection you need from wreckage of both the device and your appliances. The protection modules include smart surge control, overload and voltage protection, thermal cutoff and short circuit protection. The inbuilt fan prevents it from overheating and as an extension gives it an extended period of use compared to other models lacking this feature. Its portable makeup enables it to be installed practically on any surface and held down with some screws. At 10 inches long, 3 inches tall and 5.8 inches wide, having it installed won’t get in the way of anything else – if properly mounted. Don’t forget to turn it off after use in order to conserve energy as the cooling fan runs on the power provided by the inverter itself. Duracell is a big name in the power niche and this model shows the brand’s strength and dominance like a planted flagpole. It comes in a convenient and stylish design that makes it look less of a power source and more of a vehicle companion. This best power inverter for car is ideal for all types of travels and with the protection features, you don’t have to worry about your kids being alone with it in the vehicle. Duracell Power Inverter comes with two 115V AC outlets and two 2.1A USB ports with which you can charge up to four devices at the same time and seamlessly , given its combined output power of 175 watts. This mobile power strip comes with an extra-long cord of three-foot in length for outdoor use or extension to any location in your vehicle depending on how big the interior is. Like other inverters , this car power inverter features DC under/over voltage protections, an output overload protection, temperature (overheating) protection as well as short circuit protection. These protection features prevent any form of accidents from happening no matter how long it has been used for, and is backed by a three-year limited warranty covering any form of defects within the warranty terms. The Foval car power inverter is more concerned about protection than delivery. However, this does not exactly reduce the output of the inverter as it can power three devices at the same time with the two USB outputs and the major AC outlet. The USB ports have a maximum output of 3.1A while the AC output is powerful enough to charge devices such as string lights, breast pumps, laptops, game consoles, TV sets, DVDs and other electronic applications. The connection cable is about 16 inches long which is not that impressive compared to most inverters with 3-foot-long cables. It is built with maximum protection for itself and its user featuring an inbuilt fuse to protect your devices from power surges, safe charging feature for protection against over voltage charging, overloads, short circuiting and overcharging of the battery. The inbuilt fan runs on the inverters’ output and keeps the heat out, thereby preventing it from overheating or raising the temperature in the vehicle. With its Aluminium shell design, portability and light weight design, the Foval car inverter makes a very good travel kit. Given its dimension as 3.2 by 2.5 by 1.5 inches, it is quite easy to store in the vehicle mostly in the glove compartment. The durable metal housing also prevents it from getting damaged when your vehicle hits speed bumps or when you hard brake after speeding on the high way. It is also protected by a 100% customer service and an 18-month warranty after purchase. Buyers’ Guide – What Should Be Your Deciding Factor ? Most Smartphones / Electronic gadgets rely on AC Power in order to charge. AC Power is what electrifies homes , schools , and offices , so its easy & convenient for you to charge your gadgets at home or in office. But charging with your car is a different story . Cars get their power from batteries which is a proven source of DC Power. Since electronics need AC power and car battery outputs DC Power , its is not possibly to charge your electronics with your car without the presence of a converter. This is where Power Inverters come into play. Power Inverter converts the DC Power from your car’s battery to AC Power which can then be used to charge your electronics. The safety feature is divided into two parts – protection of the inverter itself and protection of the output supply and the devices connected to it. Make sure that whichever you choose has overload protection, fuses to protect from short circuiting and overcharging of the battery among other protection features. Also, cooling fans are quite essential in regulating the temperature of the inverter and keeping it from malfunctioning. It also prevents the inverter from overheating and altering the temperature of the vehicle itself. The number of outlets and the rating of each port is also just as important. It must be able to handle more than one device at the same time and dispense enough power to charge them simultaneously. Nobody finds a broken or exposed electronic equipment safe to use, least of all a power inverter. Aluminum covers tend to be very resistive of damages during falls and accidents. Also make sure that the dimension of the device is portable enough to be contained in the vehicle without causing any form of inconvenience to the occupants of the vehicle or being a bother to users in anyway. The length of the cord also falls under this category. Anything less than 3-foot-long range is just unacceptable considering outdoor purposes among other things. The display of a power inverter gives you access to the information in terms of the amount of power dispensed by the inverter, the amount of charge present in the battery and how long it can last for. This feature is not very common, but having it is an added advantage as you have more hands-on control over the workings of the inverter. Stay tuned to carlysis.com for more product reviews. Hey Guys! , I am Daniel Coleman and I LOVE CARS. I’m a computer programmer by profession but when not writing code , you’d find me researching on new cars and keeping up with the latest automotive trends. 5th Wheel Hitches – What Are The Best Options?